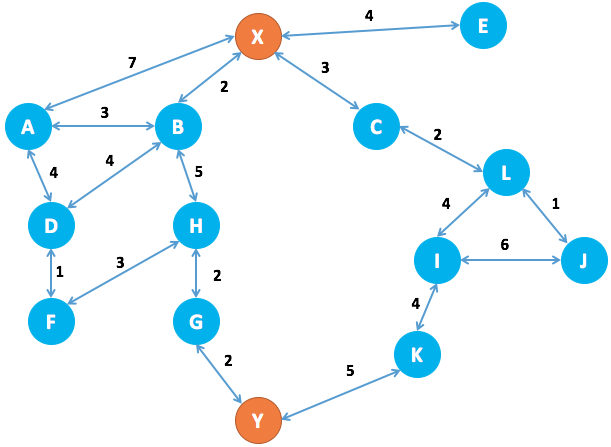 Djikstra’s algorithm is a path-finding algorithm, like those used in routing and navigation. We will be using it to find the shortest path between two nodes in a graph. It fans away from the starting node by visiting the next node of the lowest weight and continues to do so until the next node of the lowest weight is the end node. We’ll go work through with an example, let’s say we want to get from X to Y in the graph below with the smallest weight possible. The weights in this example are given by the numbers on the edges between nodes. Now we need to implement our algorithm. We choose the lowest cost option, to visit node B at a cost of 2. Next we would visit E from X as the next lowest cost is 4. We only need to keep a note of the previous destination node and the total weight to get there. We continue evaluating until the destination node weight is the lowest total weight of all possible options. For a total weight of 11. And we can work backwards through this path to get all the nodes on the shortest path from X to Y. Once we have reached our destination, we continue searching until all possible paths are greater than 11; at that point we are certain that the shortest path is 11.